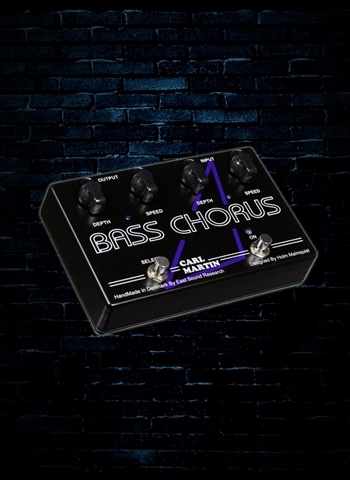 The Bass Chorus is the first in Carl Martin’s new line of bass effects. Although similar in function to the older Chorus XII, it is housed in the new wider/lower metal housing with 'chicken-head knobs’ for adjustment. Of course, the quality remains the same, and the new housing also encloses the regulated +/-12V power supply for maximum headroom and clarity. So why design a special chorus just for bass? Most chorus effects in the marketplace are designed for guitar use and therefore are mid-range heavy. The Bass Chorus has been extensively fine-tuned so that the full effect of the chorus is evident as far down as low B. Like its' predecessor, the Bass Chorus is a dual stereo effects pedal with independent sets of speed and depth controls. The 'Select’ button allows you to use or bypass the effect and the 'On’ button allows you to choose between your two chorus settings. There is an LED to show the effect is on, and each chorus has its’ own LED indicator which flashes at the speed setting. An added feature with the Bass Chorus is found when switching from a slow chorus to a faster chorus, the effect speeds up slowly for that 'phat’ vintage Leslie effect! The Bass Chorus is the only choice for bass artists when you compare features...Carl Martin quality, simplicity, flexibility and transparency.